St Cedd was sent from Northumbria to re-convert the pagan people of Essex to Christianity. Essex had previously been converted when King Sabert accepted Christianity, but the kingdom reverted to Paganism on his death. St Cedd had been trained at Lindisfarne and was sent to Essex as a missionary by his abbot. His mission was sufficiently successful that he was appointed Bishop “of the Church of the East Saxons”. Cedd was an important church figure and attended the decisive Synod of Whitby which debated and settled a dispute about the correct date for Easter between Cedd’s Celtic church and the Rome oriented church at Canterbury. Cedd died on 26th October AD 664. The Venerable Bede in his History of the English Church (written about seventy years later) mentions that Cedd established missionary churches in Ithancestir (Bradwell), which still stands, and Tilaburg on the bank of the Thames. It is not known for certain whether St Cedd’s church was in East or West Tilbury. It does not appear to have become a parish church – it may have been sacked by the Vikings or may have become the Hospital of St Mary at Tilbury. 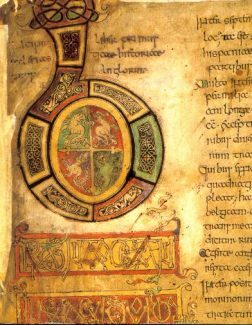 The illustration shows the cover picture of the World Classics edition of Bede’s History of the English Church and its People.